Ernest was the first born child of Henry and Emma Carlson. He was born and raised on the farm in the Danvers District. Ruth was the daughter of William and Ellen Mclnnes and was born and raised in Brandon. Ernest and Ruth were married in 1949. Before he started farming full time, Ernie worked for Ted Neilson, first in his building contracting business, and then his garage business. Over the years, he also worked for the Municipality of Clanwilliam in various jobs - road maintenance, assessor, enumerator and, for 25 years, weed inspector. After a ten year break, Ruth took a refresher course and returned to her profession as a registered nurse. She worked at the Erickson Hospital for over 20 years. To update her knowledge, she earned a diploma in rehabili­ tation nursing and registered psychiatric nursing, as well as several credits from Brandon University. They raised two sons: William and John. Bill received a B.A. from the University of Manitoba, and John received a diploma in agriculture from the University of Manitoba. They both now work for the CPR. Bill works as a consta­ ble and John works as part of the train crew. Bill and his wife, Yvonne, have two sons, Nathan and Gregory. John and his wife, Carol, have three daugh­ ters: Ingrid, Robyn and Teresa; and two sons, Roland and Paxton. Ernest died in 1991 at the age of 76. Hilda and I still reside on our farm that we returned to twenty-seven years ago. Ed and Mona continue to farm in the Hamiota area. Their daughter, Kristine, graduated from Hamiota Collegiate in 1993 and continued her education at the University of Manitoba. She graduated in 1998 with a degree in Environmental Sciences. 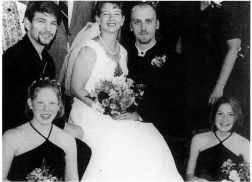 July 10, 1999 she married Corey Dyck, from Boissevain and they are now residing in Winnipeg. Jim graduated from Hamiota Collegiate in 1997 and is completing his third year of Computer Sciences at the University of Manitoba. Deb and Jim continue to work and live in the Onanole area. They have two daughters: Jennifer Leigh, born August 25, 1983; and Amanda Jean, born October 30, 1985. Both girls are attending school at Erickson Collegiate Institute. 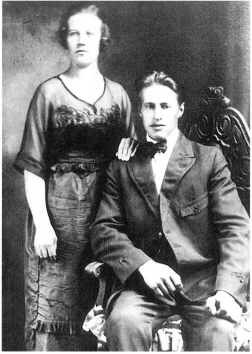 Hulda Kristina Ostrom and Ernest Birger Challbom were married in Winnipeg, MB August 6, 1920. Hulda died May 10, 1981 at age 85 years. Ernest died May 19, 1987 at age 87 years. They are both buried in the Erickson Municipal Cemetery beside their daughter, Irma.